On July 5, 2013, we are on our way from the hotel in nearly Celle to this destination. Our first concentration camp of the tour. Trying to remember the name of the concentration camp, the elderly gentleman exclaimed these words as he animated his story from the rocking chair across from me. I was in his daughter’s house on a brilliant July day, twelve summers before. It seems like a lifetime ago. But if I had not taken the time to go there and sit down with him, you would not be reading any of this. People, mostly news media, get the story wrong all the time. I had not invited the veteran to class because I had had his grandson. It was a series of coincidences that changed so many lives, but then again, I am sure there are no coincidences. Is it a coincidence that I am making my first trip to Belsen on the day that he is being laid to rest in his hometown back in New York state? Or that by 8pm I will be traveling on the same spur of tracks toward Magdeburg, on which the Sherman light tank he was commanding sixty-eight springs ago came to the train with 2500 Jewish victims of the Holocaust onboard? Daughter: Did you mention the train at all? That was kind of interesting. CW: No, I didn’t tell him about the train. CW: Well, late in the war, again a nice, beautiful April day… we were shooting like crazy across the top of Germany and Major Benjamin of the 743rd was kind of out ahead scouting a little bit… he came back to the battalion and he pulled my tank and George Gross’s tank [fellow tank commander] out. He told us to go with him. So we did. Twelve years later and here I am. I know some of the historians who work here-they have been to America to meet me- and I am going to see an exhibit that in fact incorporates some of the fruits of my labors. To date, we have reunited over 240 persons who were on that transport with the soldiers who liberated them. 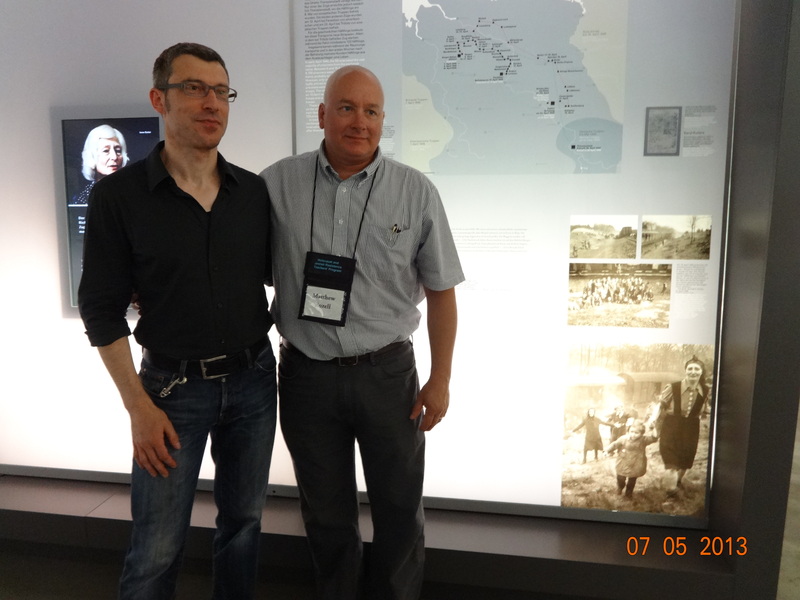 And I found the photographs that tell the story so well, photos that through the generosity of the soldiers who shared them with me, are now also in the United States Holocaust Memorial Museum, our national institution. In brief context: 120,000 prisoners passed through Bergen Belsen, and not all of them Jewish. 52,000 died here, perhaps 30,000 of them were Jewish. 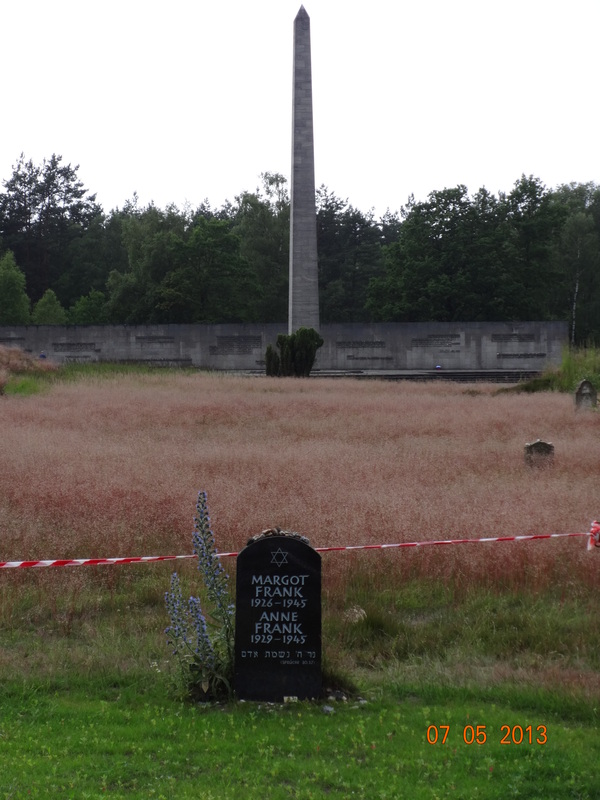 Belsen actually began as a POW camp- 20,000 Russians died here in the winter of 1941-42. In 1943, Himmler (the head of the SS) ordered that an exchange camp be set up for Jews who might possess foreign certificates or visas to emigrate, perhaps to use to bargain for German families interned abroad. 14,000 people went through the exchange camp. In November, 1944, thousands of women, and some children, arrived from Auschwitz, to be “housed” near the exchange camp, including Anne Frank and her sister Margot. What they received, in their miserable condition, were 18 oversized old tents which promptly blew down during a winter storm shortly after their arrival. With the arrival also of brutal SS administrators and guards, conditions deteriorated rapidly as the winter of 1944-45 turned into spring. The camp system began collapsing with the advance of the Red Army in the east and the British and Americans in the West. By the time the British arrived on April 15th at the camp gates, over 50,000 prisoners were suffering from extreme malnutrition, typhus, typhoid fever, and dysentery. Nearly ten thousand corpses lay about as the crematorium had long since broken down. Anne and Margot were dead, as the first Yanks crossed the Rhine River at the end of March. Hundreds died on the day of liberation. A true scene of horror. Shortly before the liberation, between April 6 and 9, 1945, 6700 men, women, and children from the exchange camp passed through the camp gates and marched several kilometers to the railhead that many had arrived at months or years earlier. Three train transports of cattle cars and shabby passenger cars were prepared and loaded. Some people were executed for attempting to steal sugar beets at the railhead . The transports would be headed for the Theresienstadt concentration camp, which at the time was far enough from advancing Allied lines and indeed would prove to be the last camp liberated on the last day of the war (I will trace that route later in our journey). Only one train made it there. The other two were liberated, one by the Americans at Farsleben near Magdeburg, and the other by the Russians near Tröbitz. 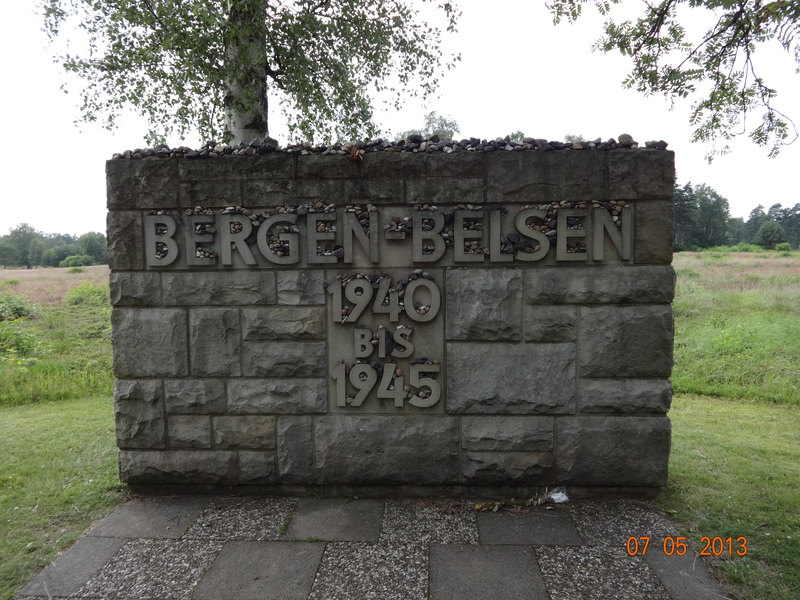 The first train left Bergen-Belsen on 6 April 1945 and travelled for six days before coming to a stop near the village of Farsleben. It was this transport that the soldiers I interviewed came upon on Friday, April 13, 1945. I promised no weighty tomes, but maybe it is too late. After an introduction to the history of the site, we watch the silent movies shot by the British beginning the second day after the liberation. Perhaps you’ve seen the photos or the films. If you see a photo of a soldier wearing a mask, maneuvering a bulldozer to push corpses into an open pit, that was Bergen Belsen. 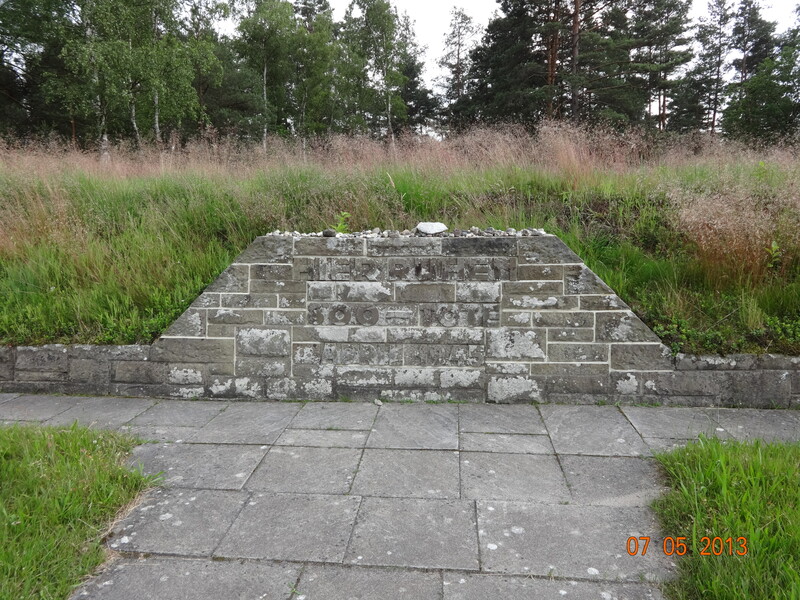 Just over a month later, the British commander ordered the lice infested, typhus ridden barracks put to the torch. So today, to some visitors, there is nothing here, just inviting walkways with interpretive signage and some markers. Woods, and open fields. 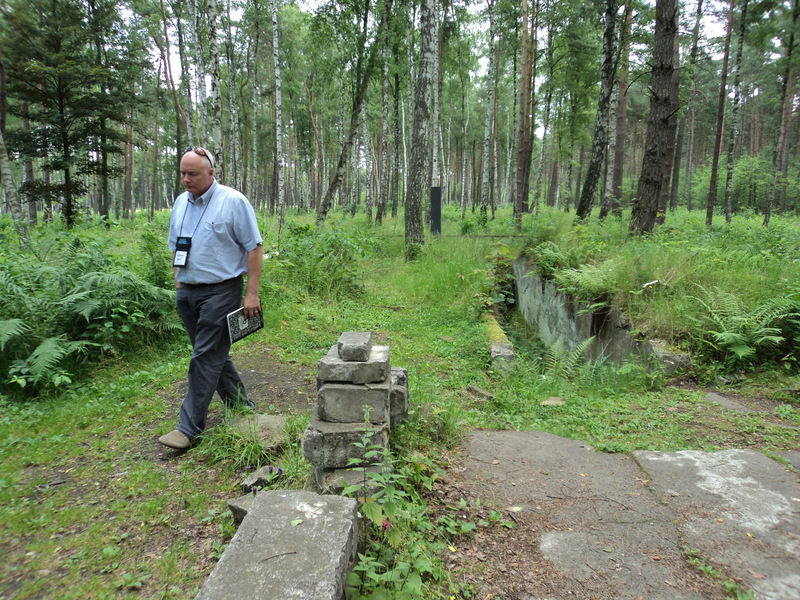 Matthew Rozell and the ruins at Belsen, 7-5-2013. Jerrilyn Miller photo. But on closer inspection, we see the outlines of the past in the ruins. We walk to barracks ten of the exchange camp. You can see the outline at the woodline. Some of the foundation stones are marked with the names of those who passed through them. We retrace the steps from the barracks to the latrine, now many meters away off a footpath in the enveloping woods. Nature reclaims. Out of the corner of my eye, down the long narrow strip mowed to infinity where a fenceline once ran, I see a large deer guide out of the woods, pause and look my way, and vanish just as soon as it appeared. Is it obscene to find in this place now a feeling of inner peace, to find beauty in the stillness of a grey afternoon? Maybe so. Back out to the camp. The solemn monuments marking the mass graves. 1000 Tote. One thousand dead. 2500 Tote. Two thousand five hundred dead. And on and on, elevated mass graves. On to the commemoration room. Candles are lit, stones are placed, the prayers are recited in Hebrew and English, led by Pauline, the only other New Yorker on the trip with me. We are all moved. Now I think of Carrol Walsh, the tank commander who led me to this story, the liberator who did not want to be called a hero, or even a liberator. His own memorial service is today, half a world away, but I am here in this place to remember him as well. It is altogether fitting and proper. And I am sure that cosmically, it is also something destined to be. This evening we depart from Hannover to Berlin. It is pretty crazy and unsettling at the Friday evening platform. 27 people have to run for the train, as the track has changed, with hundreds of others. Our original seats are taken, so we have to find other due to a mixup. But we do not lose anyone, and as I settle in next to a kind stranger, made welcome, I notice our station stops along the way- Brunswick. Magdeburg. This was not planned, either. We are roughly following the route of the train, and the 30th Infantry Division in 1945. What take us 35 minutes to cover, takes 6 nights and 7 days in April 1945.